Create your fusible bead designs with Bead Studio and transfer the design to real beads afterwards. Use the built-in generator to convert your images to photorealistic designs. Bead Studio supports palettes with bead colors from all the biggest manufacturers of beads like HAMA, NABBI, Perler Beads and IKEA PYSSLA. Either choose a single palette or use a combination to increase the number of available colors tremendously. Now it’s even possible to define your own palette, just choose "Custom palette" as your "Default palette" and then click on "Setup custom palette" in Setup, where you select which beads you have in your inventory from all the known beads. Bead Studio is made for both the serious fusible bead designer and for small children. 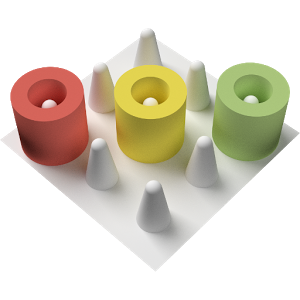 It is possible to choose boards with very few pegs for example 10x10, zoom to a level where even the tiniest hands can handle it. It is possible to change the dimensions of the palette making the beads easier to select and it is possible to disable screen rotation so this will not cause irritation and problems for the little ones. Bead Studio is very versatile. You can make huge boards with up to 250x250 beads or choose tiny boards with dimensions as low as 1x1 beads and you can choose very comprehensive bead palettes like HAMA or very limited palettes like Ikea Pyssla. The fusible bead design can be shared on facebook, email etc. You can export it to an image with a 1:1 aspect ratio with real beads using it as template for a design in real beads. Use pinch to zoom and dragging to navigate your way around the board and enable grid under settings providing the best overview when making ones design. In Bead Studio you can convert your image saved on the Android device or from the built-in camera to photorealistic fusible bead designs using the chosen palette of colors like HAMA. Use the image editor to select a subsection of the image and control contrast, brightness and gamma. Tip: Because the number ‘pixels’ on a board is often limited when making designs that can be transferred to real beads afterwards it pays to select a smaller section of the image to achieve the best possible results. It can also yield better results if you exaggerate the contrast and brightness of the image before conversion. * Internet - The app. needs to be able to access the internet to retrieve images located on webstorage like Picasa. * External Storage - The app. needs to be able to access external storage to save exported designs. * Removed ads which should not be displayed in paid version. * Fixed crash when trying to open a picture for conversion. * Increased possible board size to 500x500. * Fixed problem with images stored in webfolders. * Fixed potential crash on Android >3.2 when launching application. * Attempt to fix image editor dialog not appearing when generating from photo on some devices.